Having a roommate can be great, especially in terms of having someone to share the expenses of an apartment, but living with a roommate has both pros and cons, so careful consideration should be given to choosing a roommate. There can be some unpleasant surprises for not doing serious homework before making any decision. Done systematically, however, the outcome can be very positive... lower rent, someone to talk to, entertainment and perhaps a new friendship. 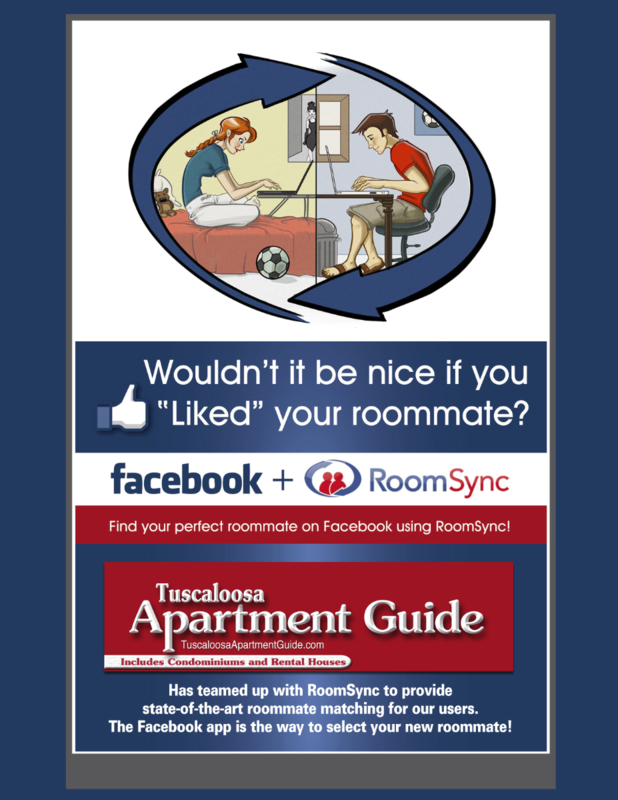 Auburn Apartment Guide has recently integrated with the Facebook app “RoomSync” for empowered Roommate Matching. The app utilizes students’ wide use of Facebook in describing their likes and personalities, and the app replaces random matching, manual matching and other matching methods that don’t provide the whole picture of a student’s personality. RoomSync gives students the opportunity to choose their own roommate using the social media tool that most feel comfortable with. Auburn Apartment Guide users are able to find their perfect roommate based on many different criteria like lifestyle preferences, majors, housing preferences, hometown, high school, mutual Facebook friends and listed Facebook interests. As mentioned, choosing the perfect roommate involves a lot of thought and careful selection, and so for non-Facebook members and non-students without access to the RoomSync app there are some steps that need to be taken to ensure a proper selection process. First, you should do some careful self-analysis to determine what kind of person you want to share living space with. -What kind of individual would best match your personality and lifestyle? -Are you neat and tidy, with an attitude about your space staying organized? If so, then you obviously couldn't tolerate someone who falls into the category of being a slob. -What are your social habits? -What gender would you prefer? It is essential to keep an open mind because you aren't likely to find the perfect individual who meets all your preferences… and being totally honest with yourself is a top priority. Begin by letting friends know that you are searching for a roommate. Also inquire with work associates. Then there are the general sources to search like Facebook, Craigslist, Twitter, etc. Some Auburn apartment complexes even offer free roommate matching service. There is no perfect formula, just be persistent. Next, examine any potential prospects carefully. Ask lots of questions. -Sleep late or stay up all night? Check off all of the usual vices, but don't stop there. Check as many sources as possible, such as internet credit check, criminal records, personal references, proof of employment, and also verify any personal information provided. It's natural for everyone to try to present the best image possible, but outright misrepresenting personal facts could indicate deeper problems. It probably pays to treat the interview like a job application. Have the individual fill out an application form. If this person is to be equally responsible for rent and utilities, then you should feel comfortable that he or she is reliable; it is better to be over-cautious than be faced with the grim facts latter. A good candidate won't mind providing you with their personal information. Make it clear that this is a business decision. Finally, when you have settled on the near perfect candidate, have a sit down conversation and hash out all the details about what is expected and when. Better to have a full understanding up front about when rent is due, who stays where, what behavior is acceptable, and all of the gory details. Better than a verbal agreement would be a written agreement or an email. A candid, open understanding can lead to a good, long lasting living relationship.